Barack Obama was caught looking really guilty as he made a speech in Berlin over the weekend. At the same time back in the States, Rep. Devin Nunes had just dropped a nuclear bomb on the former president’s head. The House Leader sent eight criminal referrals to the Department of Justice. You don’t want to miss this. Rep. Devin Nunes has fought almost two years for justice sake. The California Republican was mercilessly attacked by Democrats, who were out to destroy his life after Nunes discovered by chance the illegal FISA warrants to spy on the Trump campaign and presidency. It took great courage for the little-known Representative to come forward publically, knowing the entire deep state apparatus and their Democratic cohorts would zero in on him and do all they could to take him out. 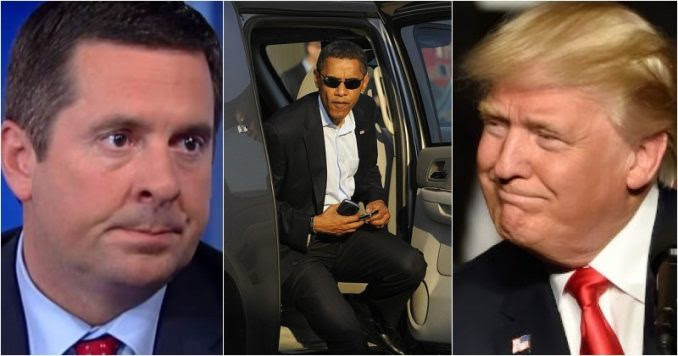 In case you missed it, it was Nunes who on March 23, 2017, informed the president during on Oval Office closed-door meeting that he had uncovered evidence that Barack Obama’s administration had been illegally spying on his campaign and his presidency. “The intelligence community incidentally collected information about U.S. citizens involved in the Trump transition,” Nunes told reporters March 23, 2017, in front of the White House. Nunes also took heat for not alerting Rep. Adam Schiff, who was the ranking member at the time. Nunes knew Schiff was a dishonest actor who couldn’t be trusted. “It’s clear that I would be concerned if I was the president, and that’s why I wanted him to know, and I felt like I had a duty and obligation to tell him because, as you know, he’s taking a lot of heat in the news media,” Nunes said on March 23, 2017, while the mainstream press claimed Trump was Putin’s puppet. That was the beginning of the uncovering of the biggest political scandal ever in Washington, DC history. Now, almost two years to the day Nunes briefed Trump on the deep state’s alleged criminal conspiracy, the Congressman is finishing what he started. Devin Nunes exclusively told Fox News’ Sunday Morning Futures that he is preparing to send eight criminal referrals to the Department of Justice this week concerning alleged misconduct from “Watergate wannabes” during the Trump-Russia investigation, including the leaks of “highly classified material” and conspiracies to lie to Congress and the Foreign Intelligence Surveillance Act (FISA) court. We can with some certainty say who are three of the five who will be criminally charged: former FBI Director James Comey, former CIA Director John Brennan, and former National Intelligence Director James Clapper. And this is where Barack Obama comes in. The very idea that his intelligence officials were illegally spying on the opposition party and candidate Trump without his knowledge is ludicrous. In fact, back in April 2017, Obama’s National Security Adviser, Susan Rice, slipped up and admitted that the former president was fully aware of the bogus Trump Russia dossier and that it was being used as a “credible source” by his intelligence officials, Comey, Brennan, and Clapper. Well, what was Barack Obama doing as this bombshell dropped? He was over in Germany pandering to Angela Merkel’s Trump-hating crowd. Obama made sure he mentioned himself a record-breaking 392 times in his Berlin speech, but his worn-out act only made him look guilty. “The 392 references in one speech is believed to be a new record for self-referencing by Obama beating a previous record back in 2016 when he referred to himself 171 times,” the Washington Times reports. However, the former president refused to say a word about the breaking news back home that is centered on his own administration. Many politicos were asking, what do you do when you are guilty? You keep your mouth shut. But if you are Obama, you talk about yourself 392 times in one speech without ever addressing the real elephant in the room: your good buddies who worked for you are being brought up on criminal charges. Obama’s arrogance couldn’t mask his nervousness. When he gets anxious, he tends to talk about himself. Well, breaking his own record in Berlin proves Obama is feeling rather exposed. And for good reasons. Rep. Devin Nunes may be seen by the elite Washington DC crowd as this Trump-supporting guy from one of the poorest farming districts in California’s breadbasket, but to many Americans, he is the patriot who had the courage to expose the Obama deep state and bring them to justice.